One such method is using the packaging of a purchase as a medium for further sales messages. Whether it’s a bag or box, it’s a medium which has already been paid for – so why not use it to its full potential by placing your message inside? What inserts can you use? These can be items such as a discount on future purchases, free samples of other products, gifts, information leaflets – anything which might create a positive response and cause the customer to return to your place of business. There’s no need to limit the scope to just physical packaging which contains a product at the time of purchase. The glove box of a new vehicle could contain any of the following types of inserts. note from the dealership owner, or a message from the service manager reassuring them of their intention to ensure an enjoyable driving experience? Isn’t a new house a sort of “package”, allowing the insertion of gifts and messages? In fact, anything which gets passed on to a customer in some from or other can be viewed as a form of packaging which can be utilized for marketing. They can be done at low cost. It can be as simple as a flyer or a message card. One can target the insert to the type of purchase made. You know what the customer bought, so you can tailor your package insert according to the type of purchase. When this takes place in a retail situation, it is obviously critical that staff are made fully aware of the objectives and the various message material. They’re the one’s who will decided on the spur of the moment which message gets inserted into the package. It lets you promote dead, slow-moving or excess stock. Build a special offer around that. It lets you make the customer feel special. Whatever it is you convey to them, if done properly it can convey an impression of how important you regard them. It can even lead to them referring others who they think would benefit from a similar buying experience. Whatever it is you do, as long it appears as if the message is being conveyed to them as customers only it is unlikely to offend – it can only increase the chances of a return visit. It is of course important that the insert is directly observed by the purchaser or the purchase decision-maker. If a product is delivered, for instance, inserting sweets into a package which is going to be received and opened by a clerk or secretary amounts to a waste of marketing money. Everything requires some thought and planning, and if necessary, research. So, what kind of messages do you create? Offer them a discount on a repeat purchase or on another relevant product or service. 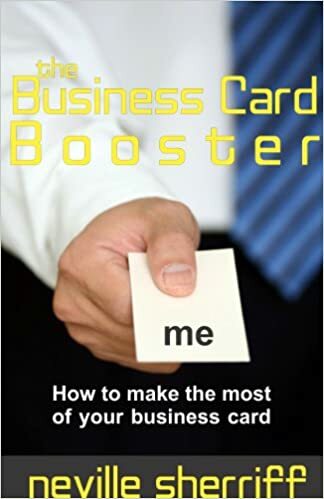 Use a printed card – business card size will do. If you want to spend a little more, go for a folded card with the offer on the front and plenty of product details and benefits on the inside and outer panels. Or, have a perforated card where one half applies to the customer and the other to a referral on their part. This depends on the type of products you sell. If it can be done it is a great way of providing additional purchase value and to introduce customers to other product lines. Check with your suppliers regarding free samples – and tell them what you have in mind for their use. They might be more inclined to support you if they realise it forms part of a planned campaign. This differs from samples in that gifts have no direct sales value or contain no obvious sales message. They don’t have to relate to your product or service line-up at all. The sole purpose is to “surprise” the recipient and to create a feeling of well-being regarding their purchase. While it might not have any direct bearing on your type of business, it heightens the impact when the gift is somehow relevant – people respond positively when they feel there has been some creativity or thought on the part of your business. It brings a human touch to both a brick and mortar or e-commerce store. medium a gift? Bottled water might at first seem completely unrelated to the profession, yet it does in some way symbolize what plumbing is all about. So a plumber could negotiate a reduced rate for a bulk supply of bottled water and have personalised labels printed – containing not just the business name but also a thank-you message. So I recommend giving some thought to what could be fun gifts but ones with impact – a variety of them is even better and can cause a talking point on social media. These require a bit more personal effort , but the effect they can have is normally well worth it. Ideally they should be handwritten, although that’s not always possible. BUT, always sign them yourself – and scribble an additional one-line very personal message if you can. They can be thank-you cards, an invitation to a new product launch – anything which lets the customer feel you are communicating directly (and especially|) with them alone. Another way to use a personal message is to ask the recipient to share their experience on your social media pages. This can be a statement on the service they received or their experience with your product. Everyone can make use of a notepad, and giving them one which also contains your logo and contact details is an excellent way exploiting your delivery package. Used beside a telephone, or for a shopping list, it is a constant reminder of your business. Get your printer to provide gummed pads of at least 100 pages – it’s usually not practical for them to gum less sheets than that – and then get your staff to peel off smaller units, 20 or so pages per package. You could even arrange with your printer that every 15th or 20th sheet contains a full promotional message or an advert for a specific product. Even if the customer tears it off and throws it away, they will have been exposed to your sales message. What size of notepad? A practical and cost effective size is a 6-per-page pad. On an A4 size that will give a pad 105mm wide x 99mm deep – more than enough space for a shopping list or to jot down a telephone number or email address. The nice things about these pads is that they can be used and distributed almost anywhere, and per sheet unit cost much less than a business card. Coming up with ideas to make the most of your delivery packaging can be a great deal of fun and need not break the bank. As always, I advise brainstorming with your staff – you’ll probably be surprised by their insight and involving them in the fun can only stand you in good stead!